It's Monday which can only mean that this weeks Read With Me is here. After a week of sick children, all germs were gone and I managed to get the chance to pick up a few books. There were a lot of great new releases last week. The trouble I had was deciding firstly which books to purchase and then of course the hard decision of which one to read first. Incase you fancy a nosey, I read Stepbrother Dearest by Penelope Ward, Fallen Fourth Down by Tijan (must read), Veiled Innocence by Ella Frank and Conklin's Blueprints by Brooke Page. All of thoughts can be found on my goodreads page if you fancied a nosey. My favourite post that was linked up last week was from over on Story Snug. I have always been a huge fan of Elmer the Elephant and Catherine shows us a few ways of how our children can learn and have fun using Elmer as the focus point. On to the link up. 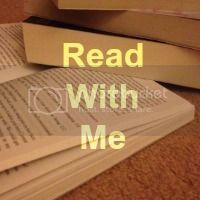 If you are new to #readwithme you can take a look here and find out just what this linky is all about. I actually had a new book post this week, yay! Hello Chantelle! Thank you for hosting this interesting linky party. Have a great day!